I was an electronic technician for Grumman Aircraft Co. from 1964 through 1978. 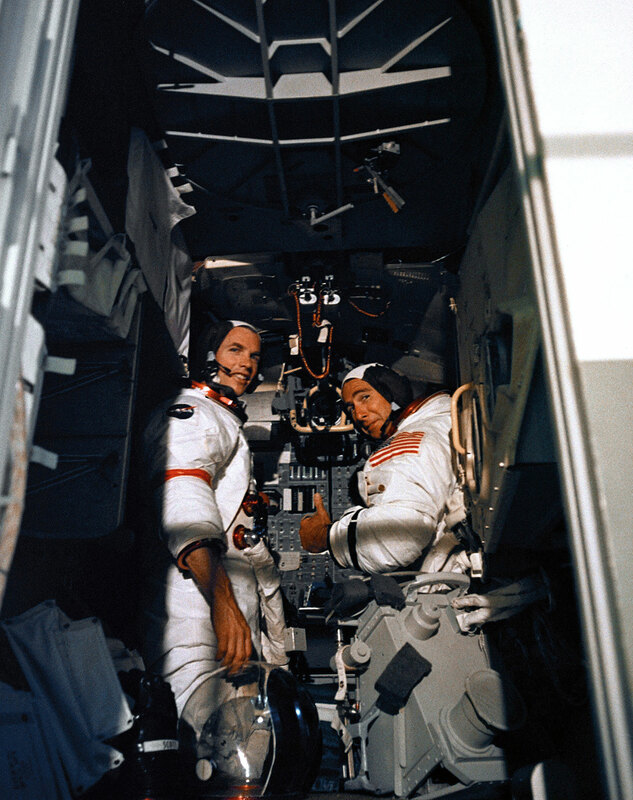 One of my duties was to operate the Lunar Module cabin during trouble shooting and testing. Back then, the astronauts spent as much time in and around the hardware as we did. One day in the MSOB (Manned Spacecraft Operations Building), I was in the cabin by myself working with two headsets on and troubleshooting two different problems with a couple of different engineers. I forget what systems were in play, but I was about 22 years old at the time just coming out of the Navy and off submarines. Out of the blue, Jim Irwin sticks his head in the cabin, and asks me if he can come in. Of course I said yes, and then set him up on one of the active channels we were working. I explained to him what we were doing and where we were at in the procedure. He thanked me and proceeded to sit up on the engine cover behind me and follow the tests. After about an hour, the engineers decided to halt testing and shut down the vehicle. I shut down the systems per procedure and turned to tell Mr. Irwin what was going on. He was sitting on the cover with his arms crossed and his head looking up and eyes closed, I said “Mr. Irwin we are powered down and going to leave.” There was absolutely no response. I proceeded to shake him by the leg. No response. Having never seen anybody do this, I did not realize he had placed himself in a trance. I thought he had died! I was horrified. Luckily at that moment he finally came out of it, and seeing me probably pale by now, explained to me he was meditating. I was glad he was OK, and thankfully no other astronaut did this while I was on watch for the rest of the program. As was all the Apollo astronauts, Mr. Irwin was a terrific pilot and a perfect gentlemen. It was always a pleasure to have him in the cabin. But at that particular moment in time, I was horrified.